Stress is used as such a cover-all media buzz word that it has become difficult to look at it with any objectivity. We will get to the physiological necessity of some forms of stress shortly. In the meantime, let us investigate the commonly accepted wisdom that stress is bad for us, has no redeeming value and is to be reduced and avoided where possible. If this is the case then why do so many of us identify as suffering from it so regularly? Why do we complain about it so much yet, seemingly, do so little to alleviate it? One of the keys to how we feel stressed is the perception that is ‘out there’ – separate from us and therefore uncontrollable. This immediately engenders a sense of powerlessness within us. In a sense, we have already lost the battle before it has begun – if it needs to begin at all because a great deal of the time at least it may not actually exist outside our own mind. So why do we have this attitude in the first place? We are a flock animal and often take our cues how to view and navigate through life from our fellow travelers on this journey. Our need to identify with and belong to the group makes us particularly susceptible to group ‘programming’ of our attitudes and assumptions. This is especially true in our early years where we watch and learn from our environment. Children of stressed parents learn to react to challenges the same way as adults. If enough people (whom, for example share and reinforce our assumed reality of say, being employed in a 5 day/week job that we don’t really like) tell us to feel down because it’s Monday or happy because its Friday, we might find it difficult not to experience those knee-jerk, programmed reactions every time those days come around. If we see enough TV that reinforces certain values and therefore how we should react when those values are questioned or opposed, we will find it difficult to have an original response of our own when we find ourselves in similar situations. ‘This = always good; That = always bad’ binary programming makes our reactions almost inevitable regardless of our individual truth. Our ability to discern and identify nuances of meaning become blunted and dulled. Our actions have really become just a constant stream of unconscious reactions by that point, like an insect being poked with a stick. No wonder we feel stressed. Because part of our identity is linked to belonging to the group, the prospect of being alienated from it is very threatening to our sense of identity and survival. By identifying as a stressed person when the group has agreed that we should be stressed gives us, perversely, a sense of shared belonging. In effect, our ego is choosing the lesser of two evils: identifying as being stressed (which is, err, stressful) versus exclusion and non-existence – which is terrifying. This brings to mind a client many years ago who experienced strong anxiety in what many consider ‘good’ weather – sunshine and blue skies. During the long, Swedish darkness of winter she felt herself in good company to be miserable as many would support her in that due to the dark, cold days. She had no such excuse in summer however and felt a kind of performance anxiety to be happy. The identification as a stressed person then, can give us a sense of ourselves. We can find meaning in suffering and stress. We investigated this idea in other blogs (click here and here) so those might also be worth a look/listen. This identification can become more toxic when we reinforce stress in each other. I witnessed a short meeting between two women on the street recently. Their body language and posture changed dramatically over the course of their brief exchange. The first woman enquired about the other’s health. She began to elaborate about a course of medication she was on when the other started to slump painfully in her posture. This caused a return enquiry about the other woman’s state of health. The woman then complained of a recent knee problem. This elicited both sympathetic ‘tsk, tsk’ sound from the first woman who then adopted an even more hunched posture of suffering herself. In the space of a few minutes these women had changed each other from otherwise unconcerned individuals going about their day to sympathetically resonating with each other as sufferers. Lest we fall into the ‘stress is always a bad thing’ trap ourselves let us briefly look at how stress reactions in the body try to help us. 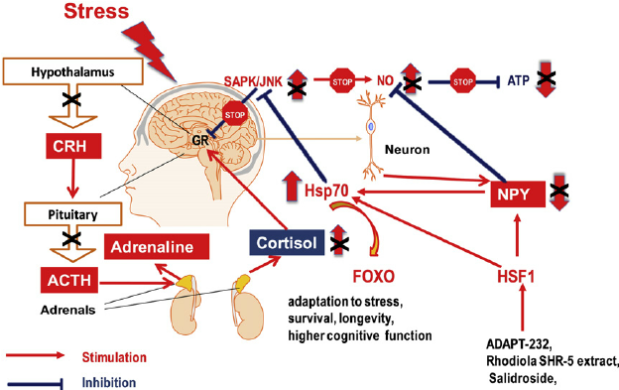 Stress hormones likes cortisol and adrenaline are produced in the adrenal glands in response to signals from the anterior pituitary gland in the brain. Typically, this is to give us the quick ‘fight/flight’ responses we may need in order to save our or another’s life in a threatening situation. Stress therefore, is a necessary component for survival. While we do not need to live in fear, a certain amount of respect for real and present danger is required if we want to experience a longer adventure on the planet. Modern, civilized life however presents far less of these genuine threats than perhaps confronted our ancient ancestors. Our responses have not been modified to reflect that however. In these situations we can still be ruled by our reptile brain which is not nuanced enough to differentiate threat levels. A simple stress trigger, like a work deadline or unexpected financial outlay for example, can elicit a similar hormonal response to being chased by a lion. Unlike our ancestors, we rarely give it physical expression and instead attempt to push it down, giving it no quick avenue out of the body. As counterintuitive as it may at first seem, stress can be addictive too. After all, it does give us a kind of energy spike to get things done quickly – if not so efficiently. In this sense it operates as a kind of drug in the system where we are both the ‘dealer’ (producer) and the user. There is a fine line between what we define as stress or excitement. It is also subjective and individual – one person’s rush or high is another’s stress or fear. The good news is that this tells us stress is also a product of perspective, attitude and adaption – all are things we can learn to control and be creative with. Therefore, for every downside there must be a upside as well. 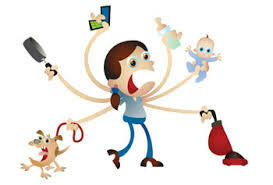 Next week we will look at some of the ways, both functional and dysfunctional we can work with stress. After all, it is also form of energy-consciousness – and energy can be transformed, by a conscious mind. 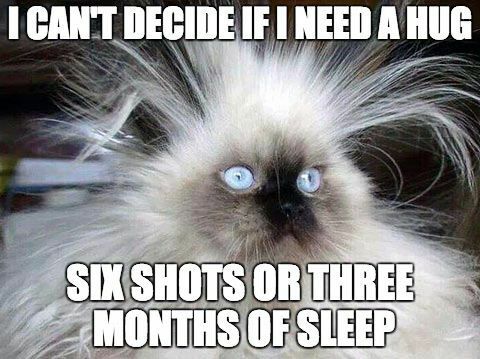 Till the programmed, collective stress of another Monday reinforces our existence once more…or not.